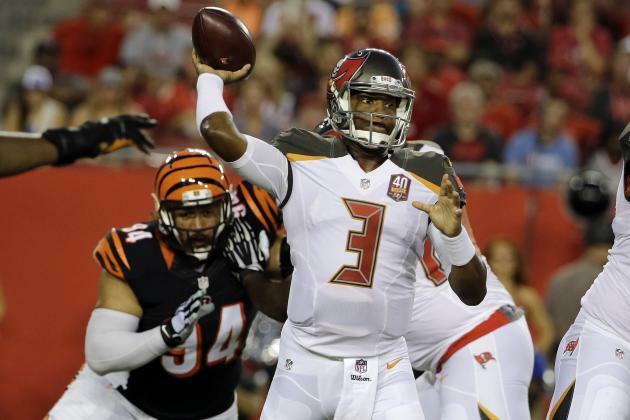 Last night, the Bucs won 25-11 against the Bengals. This was the Bucs first home win since 2013. Not only that is was a win, also it helps the team’s morale and also allows the fans to rejoice and recharge after suffering through a 2-14 season in 2014. It was a team effort in the victory, but here are some players that stood out. First, Jameis Winston looked even more comfortable in the pocket and outside the pocket. Winston shown major improvements in week 2. Winston came out the gates ready to play and was throwing the ball like the gunslinger he is. He did not look nervous throwing the ball. Winston completed 8 throws out of 13 attempts. He ran for his second preseason touchdown near the end zone. It is nice, but we all want to see Winston throw one for a touchdown, but hell it is a touchdown and Bucs fans will take it. 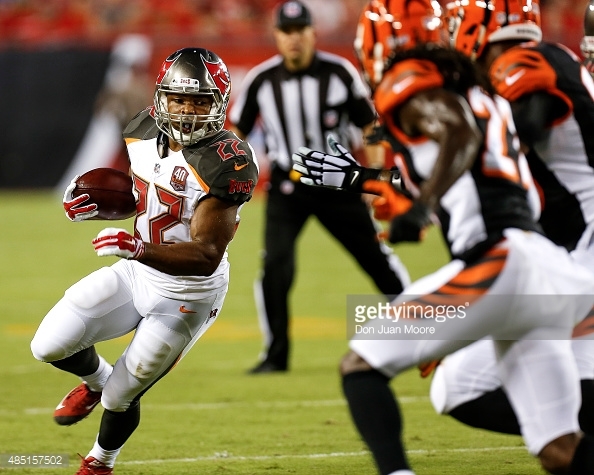 Second, Doug Martin ran like a bat out of hell. He ran the ball like he did his rookie season. Doug ran hard and hit his holes to perfection, also he was cutting through tight spots and bouncing around. The Muscle Hamster had a Marshawn Lynch moment and came out of a huge pile up and pushed his way to a huge 30 yard run. Martin’s night ended with one reception for 7 yards and running 6 times for 59 yards. Next, Lovie looked good calling the defensive plays with Frazier assisting him. Frazier lost the duties last week of calling the defensive shots. Also, having a offensive coordinator like Dirk Koetter helps out so much and he can run an offense unlike Arroyo last season. Last year was bad and Lovie fixed that problem. Futhermore, the offensive line did a good job. The first team at least. They were opening holes for Doug Martin and giving Winston time to get his passes to the receivers. No bad snaps, which they struggled with that area in the game against the Vikings. They improved and also, they had some holding penalties, but honestly some of them should of never been called. In addition, the defense looked really good. They earned 2 interceptions off of Andy Dalton. Alterraun Verner intercepted one and so did Bradley McDougald. The pass rush showed up and proved they can get to the quarterback. George Johnson looked mean and ready to go after the quarterback. He earned 1.5 sacks and the other half went to Gerald McCoy. Caushaud Lyons got a sack and Larry English is on a sack streak now. One against the Vikings and now one against the Bengals. Lets see if he can continue to show out for the coaches and fans. They made Andy Dalton look uncomfortable and that resulted in some bad plays for the Bengals. One fumble occur and Bruce Carter recovered it. Also, players making their tackles and the coverage was good too, also stopping the run seems like the defensive line’s best area. Danny Lansanah forced a safety. 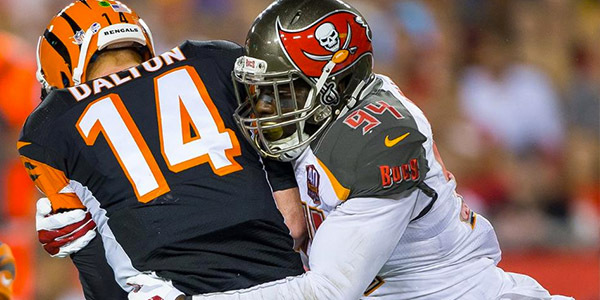 The defense will be one of the strongest units for the Bucs this year. Meanwhile, other players who stood out were Mike Glennon, Mike James, and D.J. Swearinger. Glennon connected on a perfect placed throw that Russell Shepard caught and resulted as a touchdown. 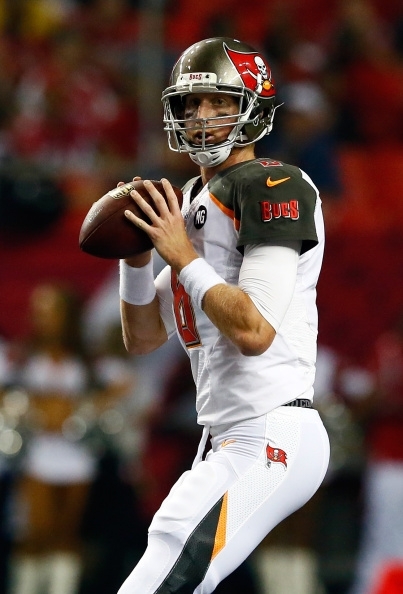 Glennon finished the night 10 for 15 with a touchdown and passed for a total 121 yards. Glennon will not overtake Winston no matter what happens, unless Winston gets hurt badly. Mike James made a nice case why he deserves to make the team again. He protected the football and ran hard with the ball for some some solid yardage. He ended the night with 9 rushing attempts and gained 39 yards. Also, James did good in the pass protection department. Swearinger disrupted a lot of passes and made some solid tackles. Swearinger is making a bid to start over Major Wright. Finally, the Bucs looked good and still need to improve in certain areas. They need to improve in limiting penalties, to get the offensive line to gel, produce more pass rushing, and special teams, even though they looked much better in 3 out of 4 of the weak areas. A little side note is that Mike Evans hurt his hamstring and will only miss the rest of the preseason and should be ready for the opening week of the regular season against the Titans.